This highly anticipated spring festival rings in 71 years of Albany tradition in 2019. 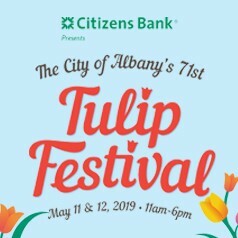 Tulip Festival features acclaimed live music, kids' activities, great food, a nationally renowned craft show and over 140,000 tulip bulbs blossoming into a sea of colors just in time for Mother's Day. The 71st Annual Royal Tulip Ball presented by Citizens Bank will take place at the 60 State Place on Saturday evening, May 11, 2019. Celebrating 30 years of music in 2019, Albany's signature free concert series is a staple of summer in the Capital Region. Thursdays, 5pm - 8pm, June through August . Albany's celebration of all the fantastic fathers of the Capital Region! September in the City Art Fair series every Thursday in Downtown Albany’s DiNapoli Park. A midday showcase for local art, music and culture, September in the City features exhibits and work available for purchase from regional mixed media artists and crafters, with a different live musical act providing the soundtrack each week. In the event of inclement weather, please review the rain policy for our events. We have numerous vendor opportunities that exist at special events produced by the City. Take a moment to review our upcoming event sponsorship opportunities and levels.